Summertime is, admittedly, not my favorite season. But all those things aside, there are a few things I do genuinely love about this season. At the top of that list? I could eat peaches. For. Days. My love for this fruit knows no bounds. I eat one every day with my breakfast during this season. Even T is shocked to see how protective I am of this fruit. Typically, he goes through fruit in this house much faster than I, but peaches? Anyway, since I love this fruit so much, I rarely do anything with them other than stuff them into my mouth raw! Once I got the idea into my head during a midnight Pinterest binge, I HAD to have it. Vegan peach sherbet. Yeaaa…I think I could get on board with that. And this recipe is pretty damn easy – using only 2 ingredients for the sherbet and 3 for the whipped cream. Simple, healthy, delicious. Though I really dig peaches on the firmer side, you’re going to want super ripe ones for this recipe. and letting it cook down on suuuuper low heat for about an hour. Pretty low-maintenance as far as homemade staples go! The first time I used this method for making homemade sweetened condensed milk, I was following one seriously amazing tutorial from Shannon at Yup, It’s Vegan. 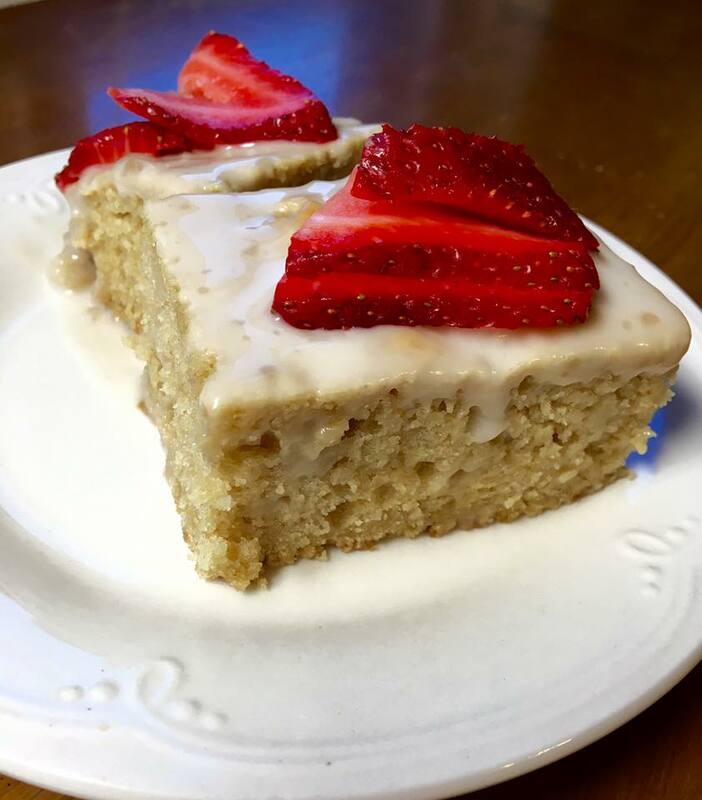 If you have any sweetened condensed milk left over after this recipe, go make that cake. Make it and fall in LOVE with it. I sure did. But I digress…again…it’s kinda my thing. 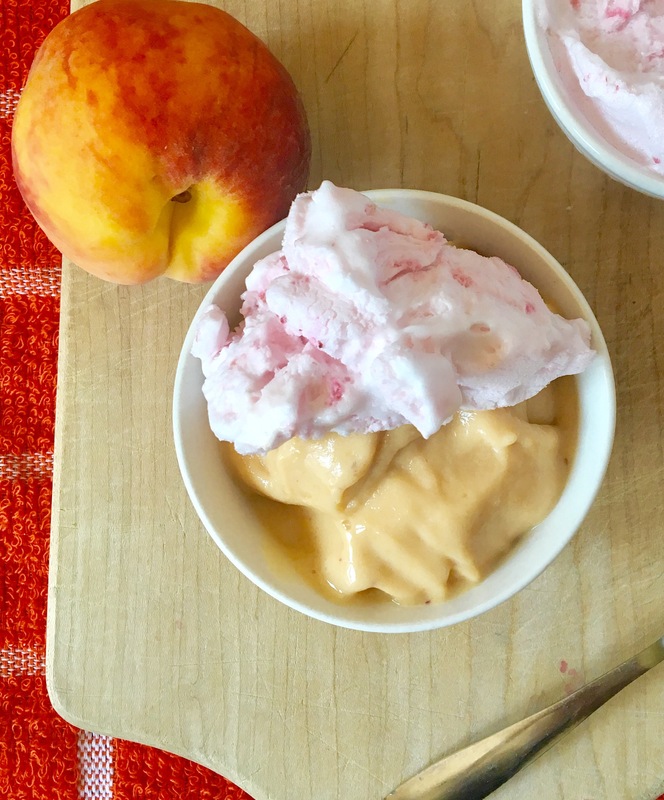 If you make this peach sherbet with raspberry whipped cream, I WANNA KNOW! Tag us on Instagram @theplantpowercouple or Plant Power Couple on Facebook. Tell us alllll about your delicious experience. 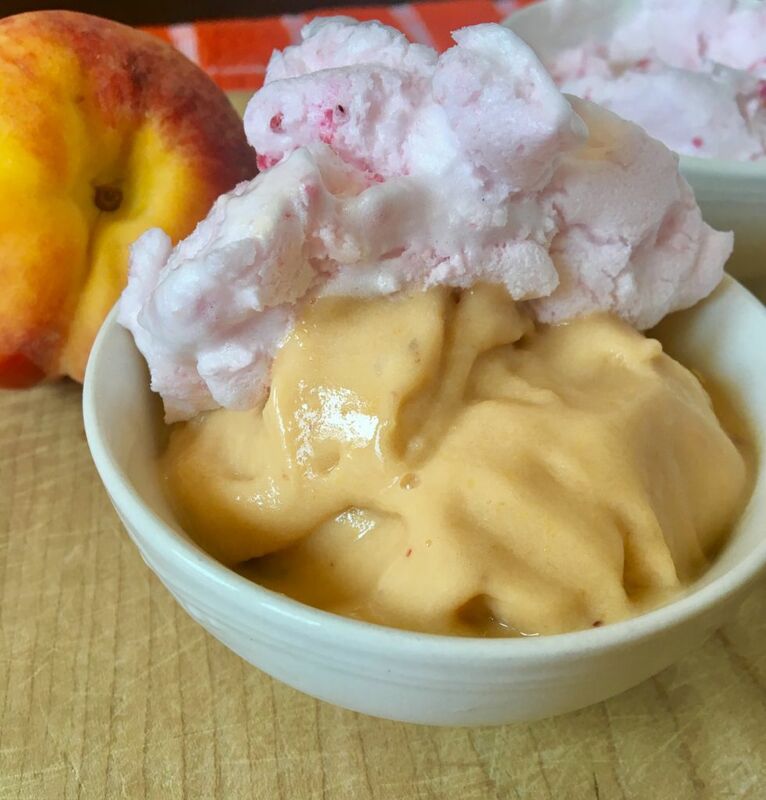 Wanna make this vegan peach sherbet LIVE with us?! Set your alarms for 12PM ET this Friday, August 11th as we go live on the Plant Power Couple FB page! If you have't already, peel, slice, and freeze your peaches (for at least 2 hours). Make your sweetened condensed milk: In a small saucepan, bring the soy milk to a boil, stirring occasionally. Reduce the heat to a simmer and add your sugar, stirring until all the sugar granules dissolve. Reduce heat to low and allow the mixture to cook down for about 60 minutes, stirring occasionally to prevent the bottom from burning. When the sweetened condensed milk is ready, allow it to cool completely. Then, add it to your food processor along with the frozen peaches. Blend until smooth. 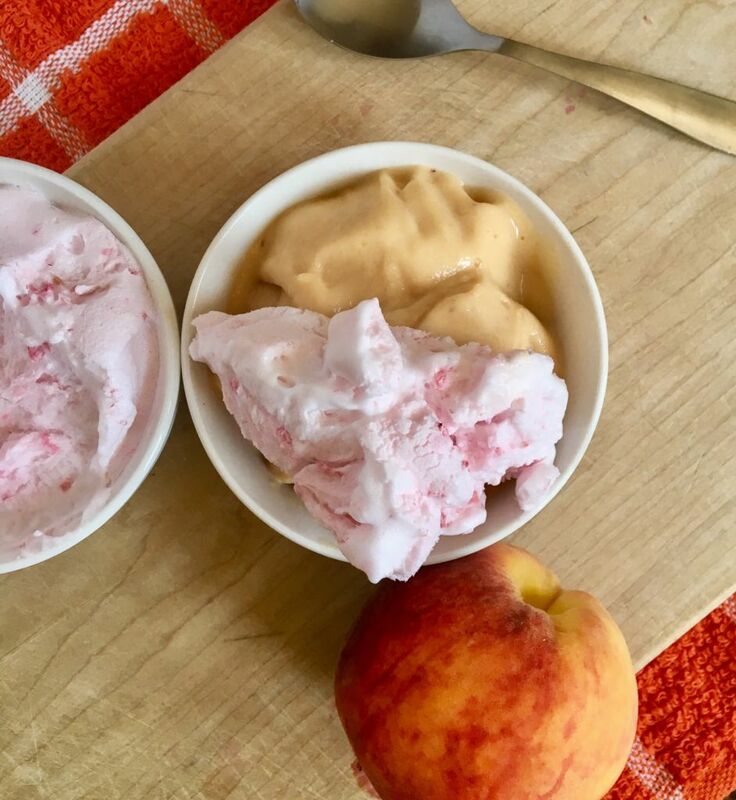 Place a few scoops of peach sherbet in a bowl and top with raspberry whipped cream. Enjoy! Hey, plant power people! 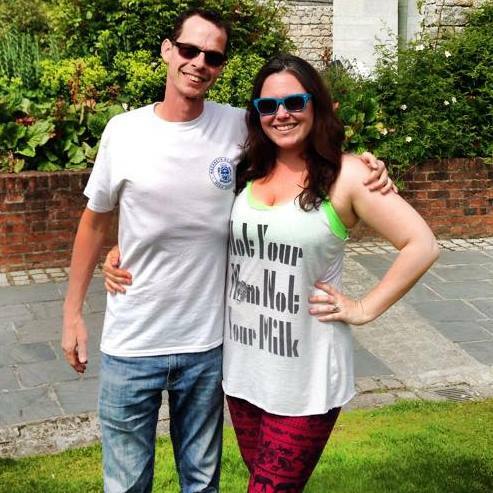 PPC is the husband-wife team of Terrence and Brittany Roche. We are two animal-lovers who have a passion for creating damn good food and hope to empower you with the knowledge and skills necessary to live a kickass cruelty-free VEGAN life!